Q. 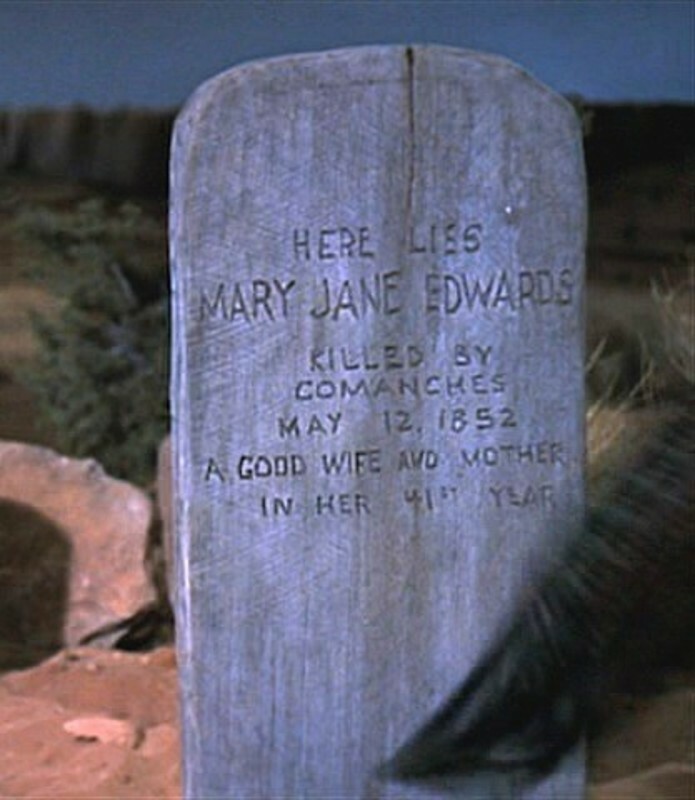 Good calls on "The Searchers", but there's also this: It's the grave marker -- her grand-mother's -- that Debbie is sent out to hide behind when the Comanches attack, where Scar finds her. It allows us to raise the question of Ethan being a man who hates Comanches because of what they are or because of what some of them did. The inscription on the marker itself is virtually invisible in the movie. It says, "Here lies Mary Jane Edwards. Killed by Commanches May 12, 1852. A good wife and mother in her 41st year." I obtained it through a computer screen capture -- technology unavailable to anyone in a movie audience in 1956. I think the question of who was meant to see it is pretty obvious; it was there for Wayne to see.